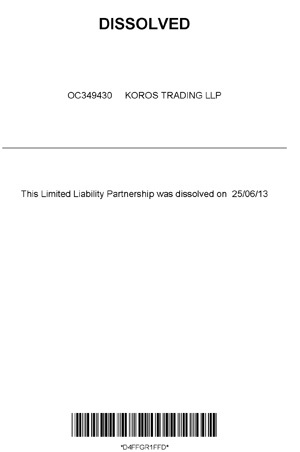 Koros Trading Limited Liability Partnership (LLP), a false front company created in London to receive regular monthly payments of millions of dollars from Rusal, the Russian aluminium monopoly, has been struck off the UK Companies Register for failing to report its annual revenues and income. Details of Koros transactions have revealed more than $25 million in payments for which sources claim there is no trading, supply or services agreement. The sources believe the money was illegally paid; they suspect the Swiss bank account receiving the funds was a conduit to a beneficiary unwilling to disclose his identity. The suspected beneficiary is a high official whose annual disclosures of income and assets for the periods identified in the Koros accounting identify no more than a Russian-source salary and real estate in Russia. The choice of name for the company is curious. Among the ancient Greeks, Koros was the name for excess of gratification. He was the son of Hybris (arrogance) and brother of Dyssebia (impiety). An analysis of the documents provided by Koros to the UK Registrar of Companies can be read here. In March, the regular deadline expired for filing of Koros’s financial return for the year 2011. It then received a notice from the Registrar, warning it had three months to comply, or else face dissolution. Koros had until June 12 to file. A similar overdue notice had been issued before to require Koros to file its 2010 financial statement. When that was finally lodged with the Registrar, it revealed that as of October 31, 2010, Koros had cash at the bank of $1.04 million and an amount of $1.29 million owed by unidentified debtors. Although registered as doing business in London, Koros’s accounts are denominated in US dollars. After $259,378 in debts Koros owed as of October 31, 2010, it counted net current assets of $2.1 million, plus a longer-term amount owing of $657,800. So total assets for Koros at the time amounted to $2.7 million. This is more than Koros had received from Rusal by the reporting date, but considerably less than it was to receive from Rusal over the following months. Records reveal Koros was paid more than $13 million in 2011, almost $9 million in 2012. There is no trace of this money in the Rusal accounts for the time period, according to the company’s published, audited reports. In London, there is also no record of what Koros was doing to earn its money and whom the company employed. The UK records reveal three front companies, GSL Law & Consulting (UK) of London as founder; and Imex Executive Ltd. and CLS Secretaries Ltd. of the British Virgin Islands as members. Had Koros filed the required financial report for 2011, the UK authorities would have been able to compare the two sets of disclosures. Instead, Koros has failed to file, and opted to hide its receipts. On June 25, the Registrar issued its dissolution notice. The cut-out has been cut out.